Nicole Hunn of the Gluten Free on a Shoestring series has a theory. If it can be made with gluten, it can be made without. As a fellow mom of a child who cannot eat gluten, I share her passion. No one wants to see her child missing out, especially when all of the other kids are indulging. Hunn’s first few books focused on covering the basics… how to make breads, muffins, rolls, dinners, and desserts. Having filled our homes with all of the foods necessary to live our daily lives, Gluten Free Classic Snacks (GFCS) moves on to all of the brand name foods off limits to the gluten free crowd. If you miss Entenmann’s donuts, Hostess Twinkies, or your favorite Girl Scout Cookie, look no further. With time and patience, you can make everything you’ve been missing and some things you’ve never even dreamed of eating. When I got my hands on GFCS, I was both excited and overwhelmed. Excited at all of the possibilities within, but overwhelmed at the thought of trying to recreate foods just so. 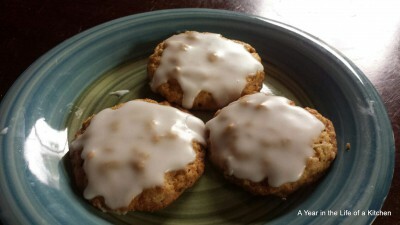 My younger daughter, who loves to bake like I do, grabbed the cookbook and we agreed upon Archway Old Fashioned Iced Oatmeal cookies. The recipe looked pretty simple, so we gathered our ingredients and jumped in. Within about a half an hour, we were munching on cookies that were really delicious. The recipes in GFCS are quite detailed, clearly laying out what and how to recreate each treat. Kitchen confidence is a must, as recipes require many steps that are not necessarily difficult, but time-consuming. Some special equipment is required, such as pans to recreate certain shaped treats, although there are instructions on how to do without. Individuals with multiple food allergies, beware. Many recipes call for butter and/or dairy in some form, and a good deal use nuts, with warnings that substitutions may not yield proper results. You can stick to recipes that are safe for your family, but may be disappointed by how many are off-limits if dairy in particular is a food that you avoid. Finally, while a book with “Snacks” in the title is not likely to be a low-cal cookbook, it’s safe to say that this book is a go-to for junk food. I have mixed feelings about that. On one hand, it’s a gift to find a compilation of recipes that can safely recreate most anything gluten-filled that your family may desire. On the other hand, I can’t see anything good coming out of my making a pan of Twix bars, for example. So while the recipes and photos look amazing, I found myself afraid to try the recipes, as then we’d have to, well, eat them. Obviously. Do I want us eating a pan of candy bars or donuts? No. These treats are best made to be shared with friends, or hidden in the deep freezer (if you have that kind of self-control)! To find out what’s new in our kitchen, stop by, or become a fan on Facebook. Peruse past blogs and keep current with new blogs at Stephanie.hvparent.com. What a crazy week! I am burning through my to-do list! Besides my usual duties as a chauffeur, chef and maid, I am catching up on some home improvement projects. It seems once you have children everything comes to a halt for oh, let’s say the first five years. With so many things happening at once, we haven’t had much time to make crafts or experiments. Not that crafting is an executive function of motherhood, but it really keeps my kids occupied. They like to mix new colors with paint, or watch something explode with baking soda. That requires prep work, some space and time. This week I am feeling uninspired and crunched for time. 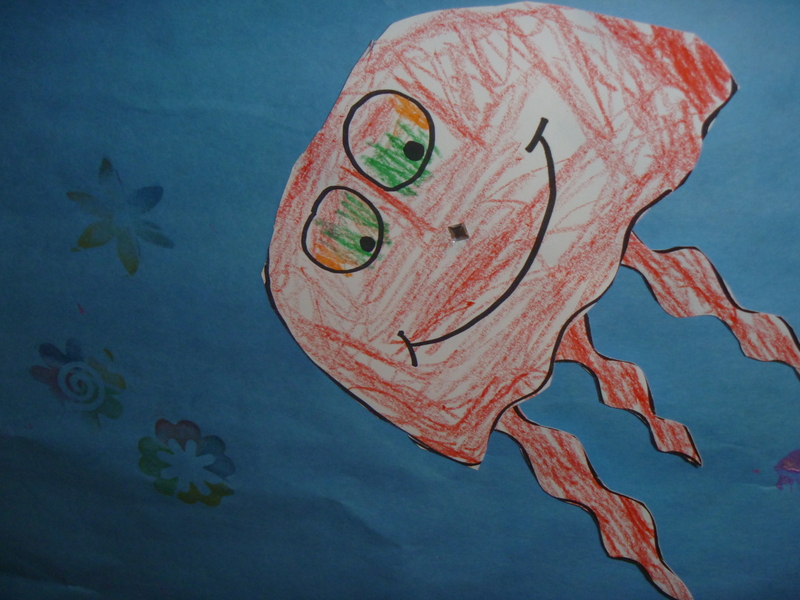 My trusty friend Karen comes to the rescue with a giant piece of blue paper and coloring pages of sea creatures. The girls eyes light up when they see the paper. They ooo and ahhh over the color and the size. We all go to work coloring our own page of creatures before we cut and paste onto the “deep blue sea.” My girls quickly decide something is missing- it needs some bling! Our perpetual mural is born! The next day we glue on jewels and add stickers. The day after that we use dot paints to make bubbles. Then we use glitter glue to make sea weed. Each day the girls realize the mural just needs a little something extra and really think about what they want to add. 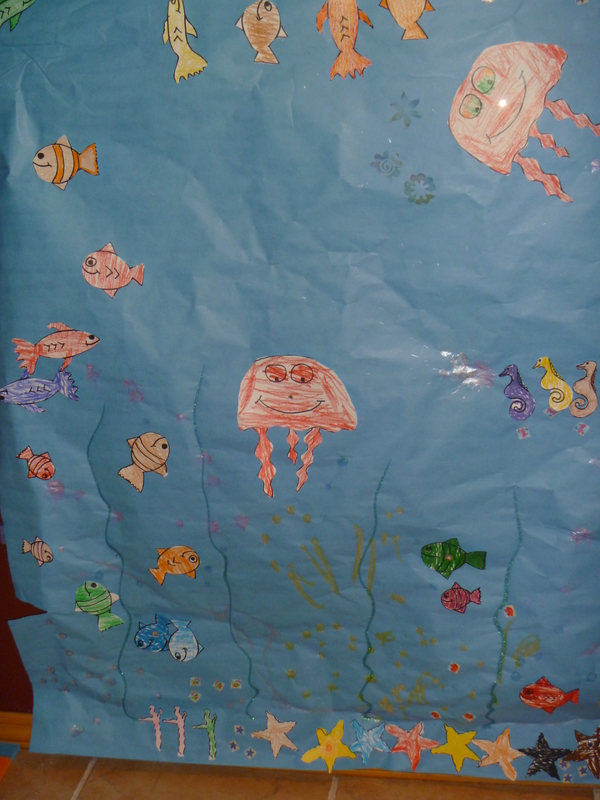 This mural project is a great way to let the kids unleash their imaginations and come up with their own plans for creating a scene. We love it so much it now hangs on the wall in our playroom. 1. Paper– if you don’t have access to giant colored paper like this you can cut open a paper grocery or gift bag and use the inside. Stop by the dollar store for a roll of craft paper, or you can even use a large piece of poster board. 2. Art supplies – let the kids gather their favorite stickers, markers, glue, photos, or coloring pages. Help them cut out shapes from a magazine, or let them add in touches of color with paint. You can start with a theme, or just start with a blank page. 3. Bling– you can never go wrong with shiny things. Use some plastic jewels, glitter glue or if you are brave enough -unadulterated fine grade glitter (that’s some expert level crafting right there). 4. Space– find an out of the way area on the floor to lay out your paper, or tape it to a wall. You want to leave the mural out where kids can come back to easily to add on to it. 5. Artistic freedom – keep your own ideas for your own projects. 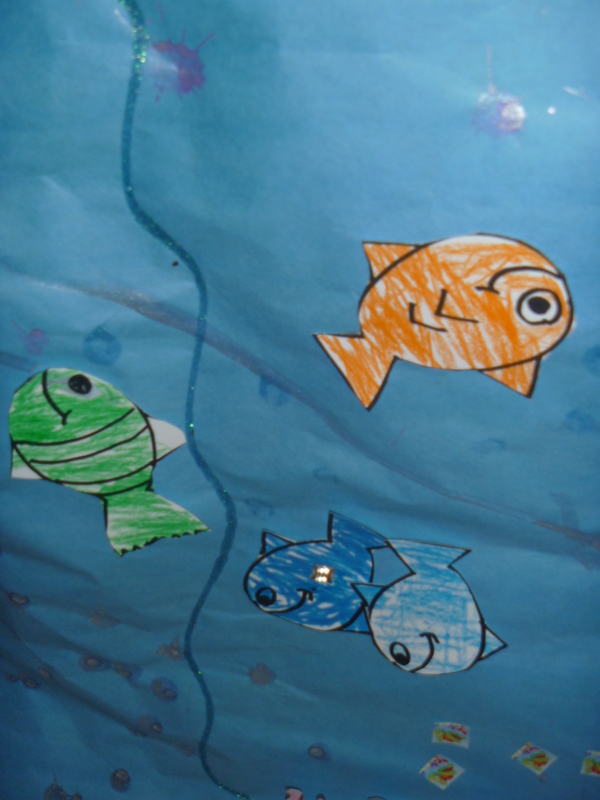 Allow your kids to spontaneously create a scene and add on embellishments. Encourage them and help them use scissors safely, or hand them stickers. Let them really enjoy the process of creating something on their own. Capture your summer vacation memories, or fall trips to the pumpkin farm by making a seasonal mural together with your kids. Add to it as much as you’d like at a pace that works for you! If nothing else you can sit back and enjoy the fact they are doing all the work… um, I mean being creative. Have you ever walked into a place or event expecting it to be “kid friendly” and sadly it was not? Then you have to make the choice. Do you stay and attempt to make your children conform to the environment or do you make a mad dash for the exit before anyone notices you? Just recently I found myself in this situation. I tried to corral my three kids as best I could, but the predictable happened. My older two kids were given my husband’s cell phone to take turns playing games on. Any parents want to guess what happened next? You got it. My older two erupted in a fight over the cell phone which led my husband to jump up and declare that we were leaving. After a family pow wow in the parking lot we decided to give it another shot. Then I spent the next hour chasing my 10 month old as she tried to crawl absolutely everywhere and when I tried to hold her she started to shriek so I would put her down. What can I say? She is discovering the world for the first time. That’s some pretty exciting stuff and who would rather be strapped in a stroller or held on a lap? My older two continued to fight, although at a more respectable decibel. But as much as I wanted to enjoy the event I couldn’t. I felt invisible eyes on me. Even if it was all in my head I just could not relax and be in the moment. It got me thinking, what does it REALLY mean to be kid friendly? Is it crayons on a restaurant table? Is it the expectation that it will be a lot louder or that breakable items won’t be in easy reach of anyone under five feet tall? Does it mean there will be an appropriate place to change a diaper or breastfeed a baby? It actually kind of makes me a little sad that we have this term at all. It means that we have to make our environments suitable for children and that of course means that not all environments are prepared to do that. If a public location didn’t have access for a wheelchair they’d be fined, but no place to feed or change a baby and that’s okay? REALLY? Why aren’t all events and venues people friendly? That means ALL People, children included. I didn’t have my kids so that I could call ahead and see if a place could accommodate their childhood. I also didn’t have them to drop them off at a sitter every time I want to go out with my husband. I’m a Stay At Home mom by choice and I do find myself at home a LOT because I don’t want to make that choice. Not everyone chooses to have kids and I get that. I also try to make sure my children behave in public because it’s the polite thing to do. BUT if I’m going to teach them to behave like an adult, which is sometimes far above what I can reasonably expect for kids their ages (7, 5 and 10 months) then I think the world needs to just start thinking of them as people. Just because they are little doesn’t make them any less deserving of space, time, patience, and a place to eat and go the bathroom. You and I were children once too. Someone made room for us in this world. Let’s make room for our kids in this world too because honestly any place that isn’t “kid-friendly” isn’t the place for me. If I have to leave my kids home well then you know where you can find me. Chia seeds rock my world. They can stand in for eggs in baked goods, they pack a punch of vitamins and even some protein when added to smoothies, and most recently, we’ve been enjoying them in “puddings.” I say puddings loosely because the puddings we make with chia seeds are, well, healthy. We’re not talking the Jello Pudding Cups (did you hear Bill Cosby’s voice?) made with dairy, sugar, and artificial who-knows-what. We’re talking fruits, non-dairy milks (unless you want dairy, in which case, feel free), and chia seeds. Calling it pudding may make it more appealing to your little ones, but it won’t change its healthy-status or desirability in your mind. The first chia seed pudding recipe we discovered was this one. It’s called Three Ingredient Banana Pudding, and it literally is three ingredients. 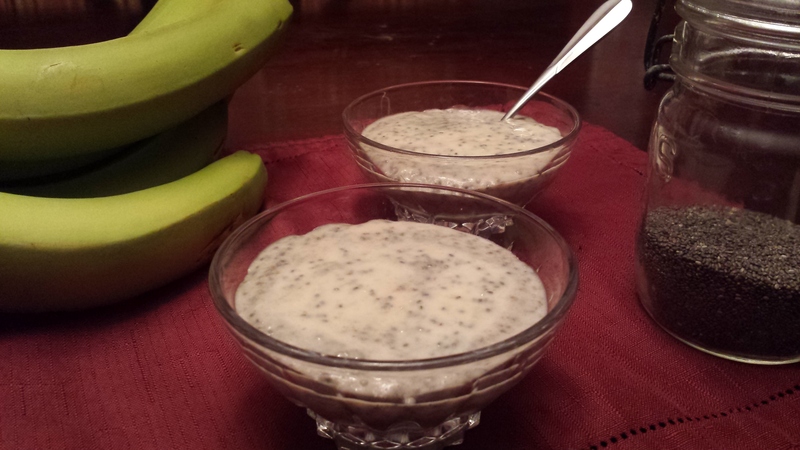 Coconut milk, chia seeds, and bananas. The recipe calls for making it in advance so it has time to thicken, but rarely are my kids able to wait once they’ve made it (kids’ cooking alert! This is one they can do all by themselves). It also suggests making it in the food processor, and we usually do, but in a pinch we’ve quickly mashed the bananas, added the other ingredients, and it’s turned out just fine. If you’re not a big banana fan (I’m not) this second recipe is more versatile and allows you to use berries. My favorite! 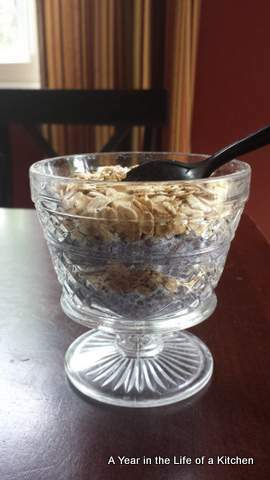 I made it with frozen blueberries for the following day’s breakfast, and my girls eagerly spooned it into parfait glasses layered with oats first thing in the morning. We’ll try diced strawberries next time. The recipe calls for “1/2 to 1 cup of almond milk,” but in my opinion, a half a cup of a range is a bit much. I stuck with the full cup, and it thickened nicely. If you avoid nuts, I suspect this would work just as well with coconut milk, rice milk, or even dairy milk. As I said, we layered it with oats. Be careful to make a thin layer of oats, as they are dry and not flavorful. The next time I made it, we used granola, which was much more palatable. Our foray into the world of chia seed puddings continues. If you’ve found a favorite recipe, please share below. To find out what’s new in our kitchen, stop by, or become a fan on Facebook. Peruse past blogs and keep current with new blogs at Stephanie.hvparent.com. Adventures Of Working From Home . . . With My Kids. Here is a little behind the scenes look at the office of The Whatever Mom. It isn’t all crafty and educational fun. It gets messy, the kids get cranky and some days I just wanna pull my hair out trying to get everyone to listen. That’s just the daily stuff. But, when you work from home and add kids into the mix you can expect total chaos. My lovely little office is not only where I spend time to write, but it is the communication hub for my entire life. I spend a lot of time in here making phone calls, networking online, organizing my dinner menu and planning our next adventure. I could easily fill a 9-5 day with all of that and walk away feeling accomplished. However, you add in potty training two kids at once, feeding two kids at once and listening to two kids whining at once, it feels like 40 hours crammed into one single morning. 1. Make A Work Space Just For You– you don’t have to get a fun office make over to have some space to call your own. Hiding in the closet in your upstairs bedroom with your lap top works too. Or, you could even call a game of hide and seek and go sit in your car until they find you. 2. Location! Location! Location! Where you locate your TV is going to be your biggest defense against interruptions. Our TV room is on the other side of the wall of my office. This allows me to close the door and lock it if necessary. Coincidentally, my office is also where I keep my secret stash of chocolate. 4. Distractify– keep things on hand that your kids can grab and go (preferably to another room). Maybe a basket of coveted toys, or shiny things; maybe a basket of books or coloring paraphernalia. Whatever will buy you at least two minutes of quiet time to finish that last thought before sending off an email. 5. Snackify– before you sit down to your desk make sure you are fully stocked on snacks you can hand off to your kids and send them away. Make it a good yummy snack that prevents them from talking for several minutes. Tip: you can toss out Gold Fish crackers like feeding baby seals as a fun way to hold off the kids. I mostly work at night when the kids are asleep, or before they get up in the morning. But, there are some days I can’t avoid a business call, or a deadline while they are around. So, the above tips have really helped me squeeze in a few extra minutes of work- you know in between sandwiches, potty breaks, sibling fights, laundry, scrubbing toilets, planning charity events and cooking dinner. 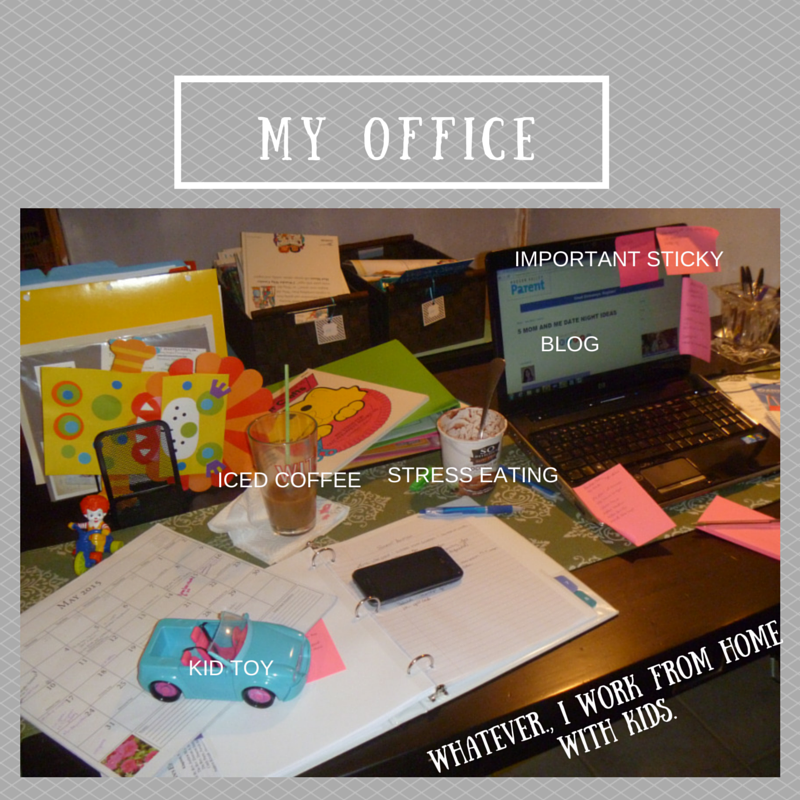 All in the day and the life of a Work From Home Mom (with my kids!). I know I’m not the only mom working from home with preschool kids in the mix. I want to hear from you! How do you make it all work? What’s your craziest work from home moment? NO ….. It is a rather simple word, yet so hard to say. Why is that? Is it because we see” No” as a negative response? Is it because we want to please everyone? I think we often say yes because we fear having to supply a reason, excuse or explanation for saying no. Guess what, you can say” no” and you don’t have to explain yourself. 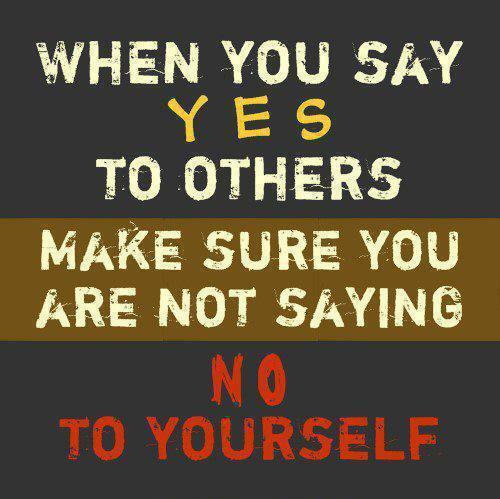 I have been guilty of being a” YES Person” nearly all my life. That is, till I realized there is positivity in saying NO! Not too long ago just like so many other parents I found myself in a “YES Rut”. I said YES to EVERY bake sale, fundraiser, book fair, class trip, play date, coffee date, book club, moms club , you name it – I signed us up for it. I think that as a parent we think that there is power in busyness. I think we respect those that seem to be “doing it all”. I know when I finally sat back and thought about my busyness I realized I was doing a disservice to myself and my family. In fact, I was NOT pleasing myself at all. I was too busy to enjoy much of anything. By not having the guts to say no I was overextending myself. I caused myself far too much stress and anxiety. Stress is toxic and can lead to a slue of bad side effects. Which for me, it did. It took working with a Health Coach for me to see the connection. Not only was I stressed and overextended, but I wasn’t saying YES to myself. I was putting my family, my health, my life and my dreams on the back burner. I was just too busy saying yes to everything and everyone else. When I finally took that first step and said no, It did feel weird, but it also felt like a weight was lifted off my shoulders. I remember sitting at the ball field and actually watching and enjoying my own children as oppose to babysitting the entire team. I remember almost feeling guilty. I am telling you, DON’T feel guilty saying no! DON’T feel guilty enjoying your life! 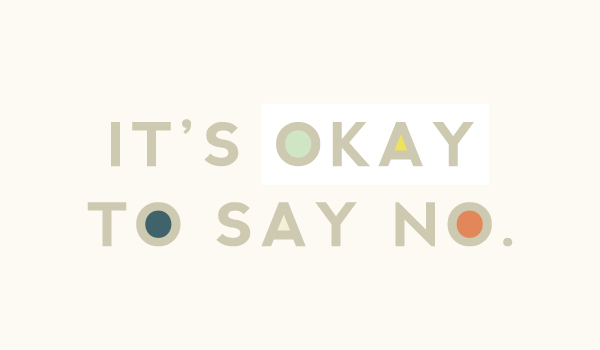 DON’T feel guilty for not saying yes! I now have time to enjoy my kids – after all, they only stay kids for so long. I can go back and be a volunteer” yes junkie” again, but I will never get to be their mom while they’re little again. Embrace the freedom you have to say no! You will be surprised at all the positives that result! We love the farm. We are so lucky here in the Hudson Valley to be smack in the middle of such diverse areas. Only a few minute drive and you can be in either a city or a farm. My boys and I spend many summer days visiting the cows, riding horses and petting the goats at some of the nearby farms. 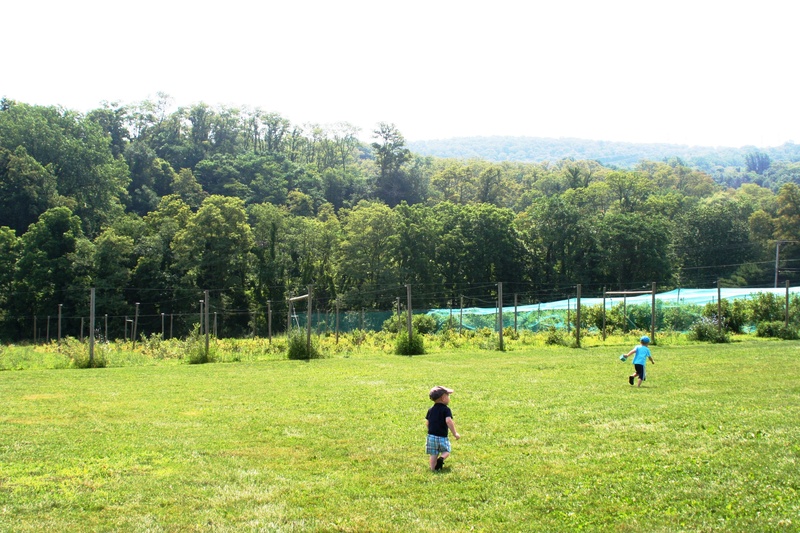 Our favorite, Sprout Creek Farm has a super friendly staff, lots of animals and absolutely delicious ice cream in the summer! 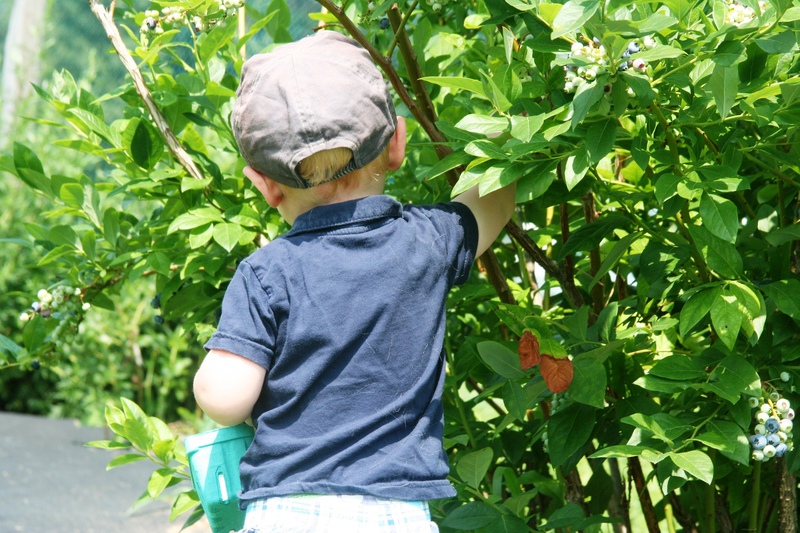 Another favorite farm activity is berry picking. 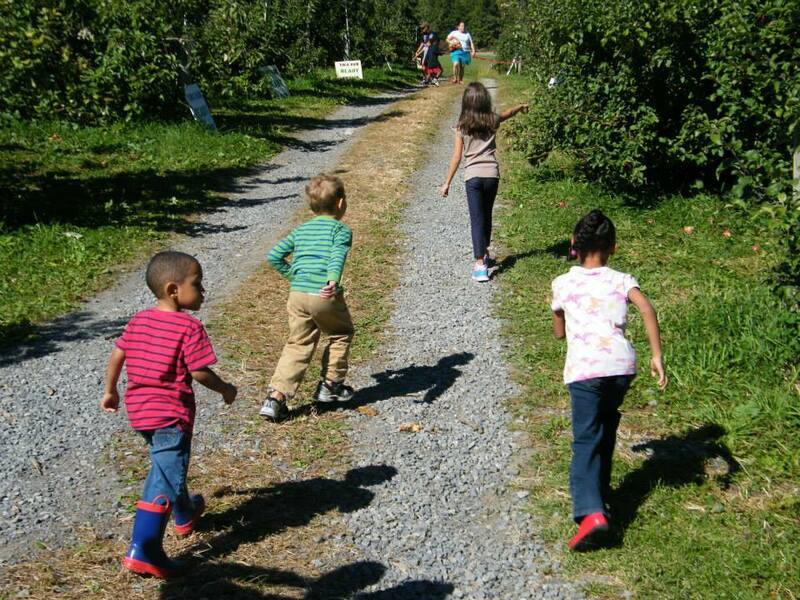 We are excited to jump into the fields and pick our own fruits to turn into delicious treats So many of our local farms offer animals for petting, fresh foods, classes and even activities such as playgrounds and jump pillows. Since I have 3 (yes, daddy counts!) 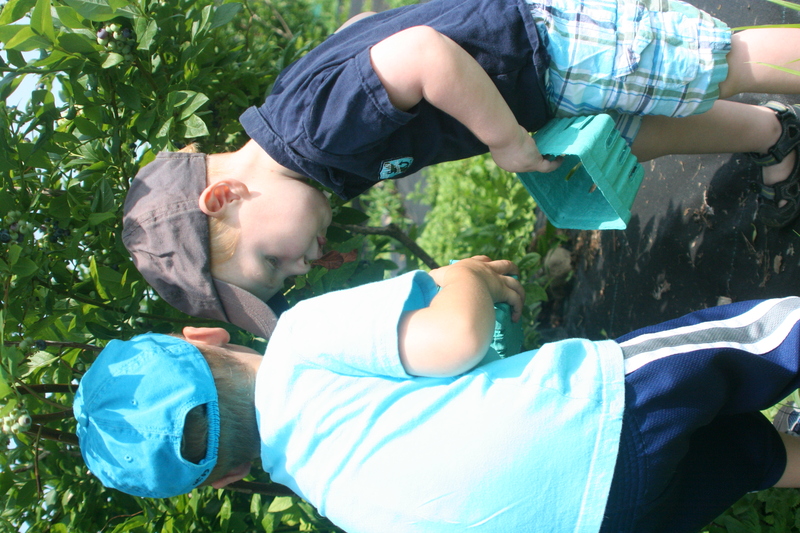 healthy, growing boys who consume their fair share of foods I often thought about joining a local CSA (Community Supported Agriculture share). Though I have to admit I only knew it meant you got your foods directly from the farm. I started talking to friends who participate and read articles around the web. (Hint: HVParent have a good one here) and was really interested! Then I had to build a case for my dear, penny- pinching husband. I first had to prove that we would be in-fact saving money despite the hefty upfront costs and I had to back up the money facts with all the ways I felt a CSA share would be a good fit for our family. So I am sharing with you today, not only 23 Hudson Valley Farms that offer CSA shares but also my Top 10 reasons to join a farm CSA! 1. I would say probably the #1 reason why CSA’s are wonderful for families are because you are receiving great, local, farm fresh food at a great price. While paying upfront might seem a bit daunting to the budget, many have done the math and decided that savings of a CSA outweigh the costs of purchasing organic quality foods. 2. Many times you open your box to discover foods you haven’t tried before or maybe have never even heard of! As part of a farm CSA you may discover delicious new foods, try new recipes and get an opportunity to introduce the kids to many different things. 3. You will most likely eat healthier. Often times that fresh bunch of arugula looks more appealing than a can of peas! 5. Make it into a fun outing for the kids. Pick-ups are a lot of fun, especially at a farm with different animals to visit and feed and kids get a first hand look at where our food really comes from… more than just a supermarket! 6. When you are able to see the work that goes into each plant, you watch it grow, you touch, smell and taste it straight from the farm you have a better appreciation for the foods and are more likely to eat them. Both solving picky eater dilemmas and creating healthy meals! 7. 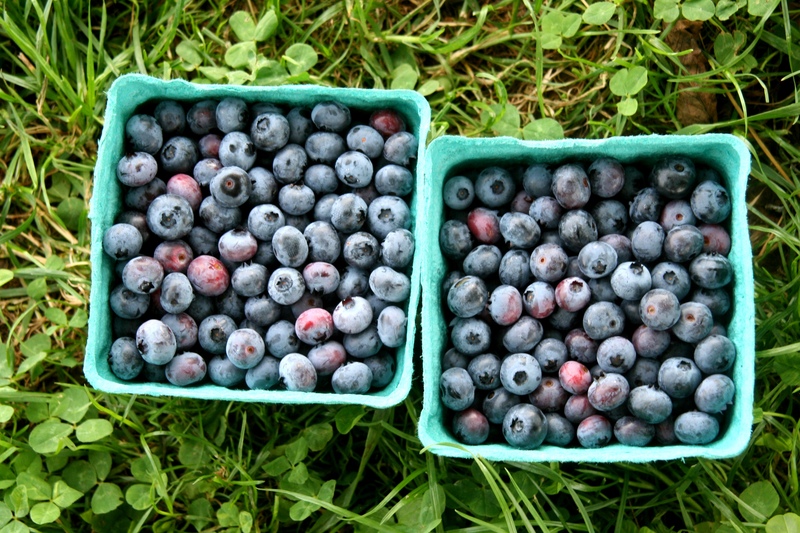 Many farms that offer CSA shares have dedicated sections specially for U-Pick options. Some put no limits on the amount you pick! (Though a general rule of thumb is to not over pick, the point is still a share here). If you are a family like us who love to pick our own fruits throughout the season you know how much that adds up! 8. Becoming a part of a CSA is truly a sharing community. Members will often swap recipes at the pick- up line, kids play in the fields and you overall feel good about helping and being a part of the community. 9. 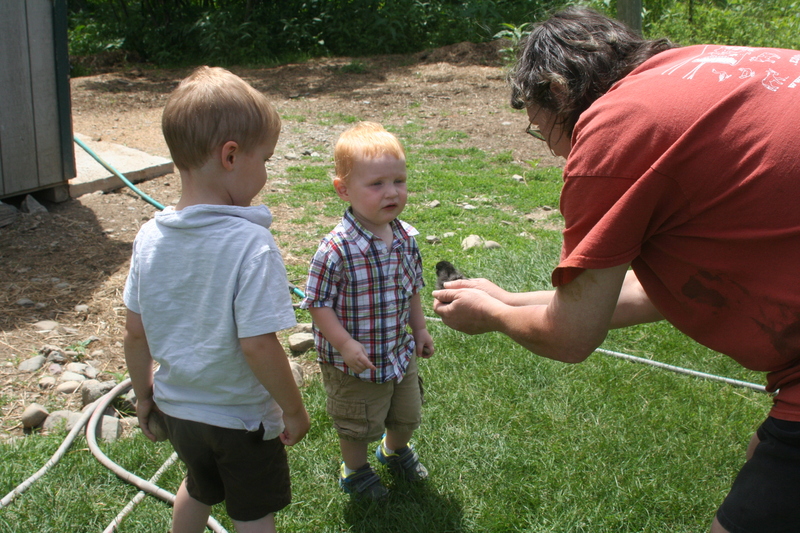 Many farms offer education, workshops and special events. Have you ever wondered how to pickle those cucumbers? Check out your local farms and see if they offer any workshops near you! 10. When you join a CSA, you are protecting the environment, supporting farmers, small businesses and all around creating a better planet for our children’s children. What better reason then that? So I just read this post on Babble, “Can You Stay Friends With Someone Who Has A Wildly Different Parenting Style?” In it, the writer expresses exasperation with her old friend who is a “helicopter parent” because she is a “free range parent.” She wonders aloud, as all bloggers do, if she can remain friends with this woman. I wanted to laugh at the end because I immediately thought of my neighbor and very good friend Allison. 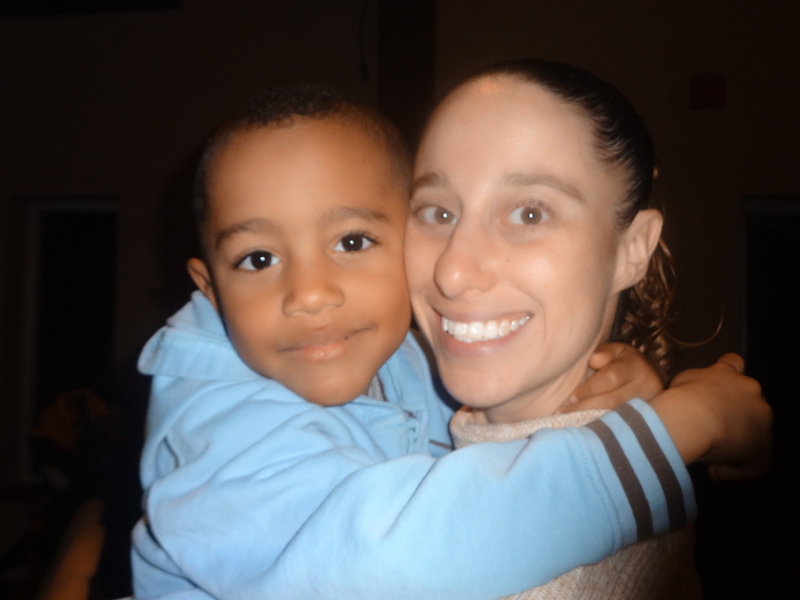 Allison and her son Avery. I didn’t know her growing up. We aren’t old friends as is the case in the aforementioned article. We have been living in the same neighborhood for the past eight years, but didn’t meet until our daughters’ Kindergarten Open House three years ago. Ironically, I had just pitched an article to Hudson Valley Parent and even though I was there wearing my “mommy hat” trying to learn all about the school and teacher I was also wearing my “writer hat” and was scoping out parents to interview for my article. As soon as the presentation was over I made my way over to the teacher to ask questions about programs for engaging children that were advanced and I overheard this woman asking the question that was in my head. I knew then that I was going to interview her. I had no idea at the time that we lived in the same neighborhood or that our kids and of course we would become amazing friends. I’m a firm believer that we are all crazy. We just find people that are “our brand of crazy” to hang out with. Al will be the first to admit that she’s a bit paranoid when it comes to her kids. She keeps them very close. I’m a bit more free range if you will. I take the stand that falling is a part of life so brush it off and get back on the bike. But it never for one second would occur to me that we couldn’t be friends because of it. I know we parent differently, but I recognize that we are different people and that’s cool. Her babies were born premature and I cannot imagine how hard it must be to see your tiny little baby hooked up to machines. Not being able to leave the hospital with them seems unimaginable to me. 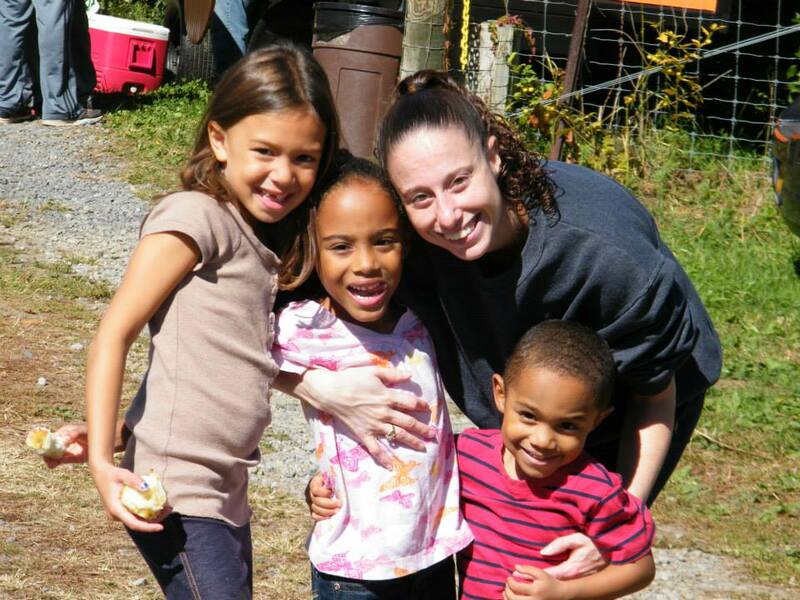 Hannah, Jordyn, Allison and Avery on one of our many family outings. It doesn’t matter to me that we parent differently. What matters to me is that she loves my kids like her own and vice versa. So I try to put myself in her shoes and think maybe I would hover more if I had that experience. I was raised free range, allowed to walk miles down the road to the corner store by myself at 10. If I can see my kids I don’t mind letting them play on their own with just a few “check-ins” now and again. I can also recall with horror a few times I should have hovered more. Like the few terrifying minutes I lost Jay at the Wayne County Fair because there was a large group of people with us and I wasn’t holding his hand. I’ve grown so disheartened by parents who think there is only one way to parent. I think parenthood is craziness in its own rite. But it’s a fluid kind of crazy. I’m allowed to be paranoid about certain things and more trusting about others. Just because it might seem that we fall into one parenting camp or another doesn’t make it true. I read the comments on articles about say cry it out sleep training and you will see the flags flying. I was perhaps the only one to comment that I both co-slept with my babies and later sleep trained them. Maybe it’s because Allison and I both have mixed children that we literally know the world is not black and white, but both. Our children are kind, loving, smart and well-adjusted kids because of their moms; different parenting styles and all. (Ok, because of their dads too. I will never hear the end of it I don’t add that our kids have some pretty amazing dads too). Best of all they love each other like siblings not just friends. It does mean they also fight like siblings at times too, but that’s what family does. How could I ever not be friends with her because we parent differently? We surpassed mere friendship a long way back. 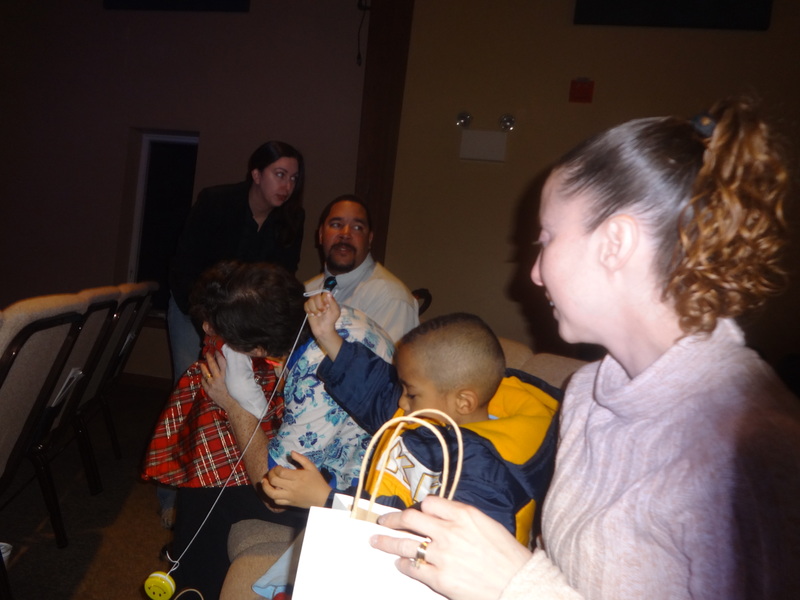 I’m very religious and Allison’s not, but that didn’t stop her from attending the dedications of my children at church. That’s what family does. I am not a perfect parent. She is not a perfect parent. But her shade of crazy matches mine perfectly and the only parent I really don’t trust is one who doesn’t see their shade of crazy at all. So stop waving your flags parents unless you’re willing to let your crazy flag fly. Only then will you find the friends that last a lifetime. It just so happens to be Allison’s birthday today so Happy Birthday to my sister from another Mister! I volunteer to show the world my crazy, but you letting me show the world yours is just another reason I love you! Spring is here (we’ve even had a few days that felt like summer!) and suddenly it’s the time of year when your dinners can transform. Instead of heavy soups, stews, and baked casseroles, meal prep moves outside for grilling. I have three favorite things about grilling. One, there’s less prep and ingredients. Most meats, vegetables, and potatoes can be made on the grill with very little pre-planning or fuss. Two, the outdoor assembly results in less indoor mess– scraping down the grill is a lot easier than washing a sink full of pots and pans. And three, my husband loves to BBQ (most guys do, it seems) which means I can keep busy indoors while he handles the cooking outside. As a side note, most grilled items are naturally gluten-free, which is a plus. Score! The other night, my husband offered to run to the grocery store on his way home from work so that he could BBQ dinner. He snagged salmon, a bag of baby peppers, and some avocados. 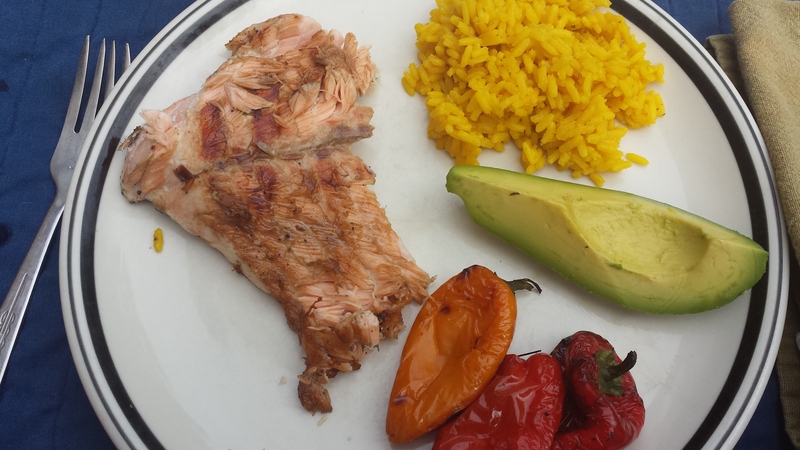 I made a quick rub for the salmon, a pot of Spanish rice, and dinner was done. Combine well until sugar is dissolved, and brush on salmon before and during grilling. Peppers grill well on an upper rack, if available, or over a low flame. This goes well with grilled vegetables, a green salad, or a pasta salad. Planning a quick, healthy outdoor meal doesn’t have to be complicated or require a lot of clean-up. Enjoy the ease of summer BBQs and spend your extra time with friends and family. We followed our dinner with a family game night on the deck and watched the sun set as we relaxed together. How we missed the sunshine! If your family has a favorite BBQ recipe, share below. To find out what’s new in our kitchen, stop by, or become a fan on Facebook. Keeping up with the demands of being a wife and a mother is not easy. I feel like everyone wants a piece of my time. I realize how important it is to set aside time to be with my spouse. It isn’t always easy, but as a married couple we need time to connect, catch up and remember why we love each other. We often set aside one night a week for a date night just so we can do all that. The same idea can apply to my relationship with my kids. After rushing through the weekly demands of school, soccer practice and play dates, my kids and I could use time to connect and relax together. It gives me a break from barking commands, err um… parenting demands and we can just enjoy each other. So, we have a regular date night too. My life before kids meant Fridays were for partying with “the girls.” Now my Fridays are for snuggling with MY girls. We make a pizza, make some snacks and watch a movie together. Sometimes we get a little take out, but making our pizza gives us time to be in the kitchen together. For me, being in the kitchen with my mom is a very fond memory and I love that I can share that with my girls. If you want to spend some quality time with your kids set up a night each week to go on a date with one or all of your kids. You don’t have to break the bank, or do anything super fancy. Keep it simple at home, or head out to a favorite restaurant. Whatever is easiest (and most relaxing) for you! 1. Dinner and a Movie– Pick out a favorite DVD, or find a movie on Netflix. Order in, or make your own pizza. It’s Friday night so do what ever is easiest and allows you to spend the most time with the kids! When my kids were really little we’d pile into my bed to watch a movie. 2. Go Stargazing– On special nights I let the kids stay up later so we cay lay out underneath the stars. It is amazing to hear the questions kids ask about the moons, the stars and life in general. 3. End The Week on a Sweet Note– Go out for ice cream, or make your own. It’s almost summer so pull out those Popsicle molds! We like to freeze good ol’ chocolate milk for a simple alternative to ice cream. These moments make for great traditions and wonderful memories. 4. Have A Sleep over- Camp out in the living room, camp in the backyard or let everyone pile into one bed. My girls love, love, love getting to kick my husband out of our room for a “no boys allowed” night. They won’t want to be this close forever, so I am happy to soak up all the extra snuggles while I can! 5. Spa Night– Kids love massages too! Boys or girls will enjoy a foot rub, or back rub after a nice bubble bath. Take turns applying a favorite lotion or oil to each other’s hands and feet. It’s a great way to physically wind down from the week. This was our first official date night when the girls were too little to watch a movie, or go for late night adventures. This summer I am excited to try switching things up a bit and introducing my girls to a drive in movie. What are some of your favorite mom and me date night activities? Here are 5 Best Practices for Date Night with your spouse.